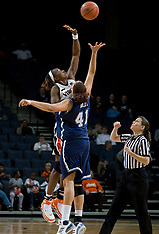 Photographs of NCAA women's basketball teams including images of the University of Virginia women's basketball team and teams from other colleges and universities. 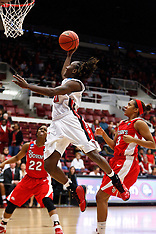 March 21, 2011; Stanford, CA, USA; The Stanford Cardinal defeated St. John's Red Storm 75-49 in the second round of the 2011 NCAA women's basketball tournament at Maples Pavilion. 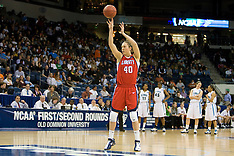 March 19, 2011; Stanford, CA, USA; The St. John's Red Storm defeated the Texas Tech Lady Raiders 55-50 in the first round of the 2011 NCAA women's basketball tournament against the St. John's Red Storm at Maples Pavilion. March 19, 2011; Stanford, CA, USA; The Stanford Cardinal defeated the UC Davis Aggies 86-59 in the first round of the 2011 NCAA women's basketball tournament at Maples Pavilion. 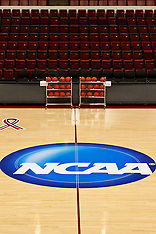 March 18, 2011; Stanford, CA, USA; St. John's Red Storm, Tech Texas Lady Raiders, and the Stanford Cardinal held practices the day before the first round of the NCAA Women's Basketball tournament at Maples Pavilion. 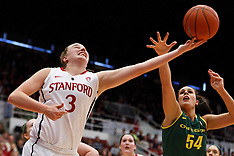 February 26, 2011; Stanford, CA, USA; The Stanford Cardinal defeated the Oregon Ducks 99-60 at Maples Pavilion. 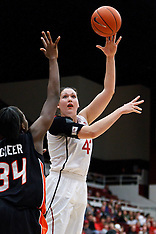 February 24, 2011; Stanford, CA, USA; The Stanford Cardinal defeated the Oregon State Beavers 73-37 in NCAA Women's Basketball at Maples Pavilion. 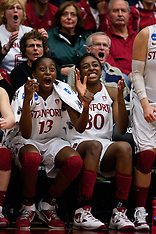 January 20, 2011; Stanford, CA, USA; The Stanford Cardinal defeated the UCLA Bruins 64-38 at Maples Pavilion. March 29, 2010; Sacramento, CA, USA; The Stanford Cardinal defeated the Xavier Musketeers 55-53 in the finals of the Sacramental regional in the 2010 NCAA womens basketball tournament at ARCO Arena. 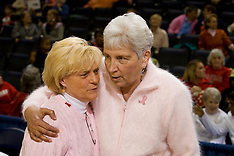 March 27, 2010; Sacramento, CA, USA; The Xavier Musketeers defeated the Gonzaga Bulldogs 74-56 in the semifinals of the Sacramental regional in the 2010 NCAA womens basketball tournament at ARCO Arena. 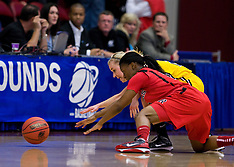 March 27, 2010; Sacramento, CA, USA; The Stanford Cardinal defeated the Georgia Bulldogs 73-36 in the semifinals of the Sacramental regional in the 2010 NCAA womens basketball tournament at ARCO Arena. March 22, 2010; Stanford, CA, USA; The Stanford Cardinal defeated the Iowa Hawkeyes 96-67 in the second round of the 2010 NCAA women's basketball tournament at Maples Pavilion. 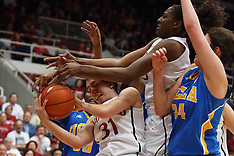 March 20, 2010; Stanford, CA, USA; The Stanford Cardinal defeated the UC Riverside Highlanders 79-47 during the first half in the first round of the 2010 NCAA womens basketball tournament at Maples Pavilion. 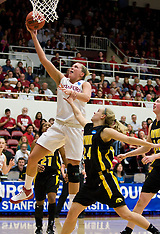 March 20, 2010; Stanford, CA, USA; The Iowa Hawkeyes defeated the Rutgers Scarlet Knights 70-63 in the first round of the 2010 NCAA women's basketball tournament at Maples Pavilion. 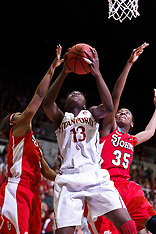 February 20, 2010; Stanford, CA, USA; The Stanford Cardinal defeated the Oregon State Beavers 82-48 in NCAA Women's Basketball at Maples Pavlion. 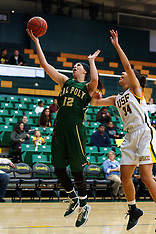 February 18, 2010; Stanford, CA, USA; The Stanford Cardinal defeated the Oregon Ducks 104-60 in NCAA Women's Basketball at Maples Pavilion. 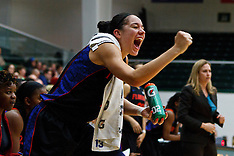 December 22, 2009; San Francisco, CA, USA; The Tennessee Lady Volunteers defeated the University of San Francisco Doms 89-34 in NCAA Women's Basketball at War Memorial Gym. 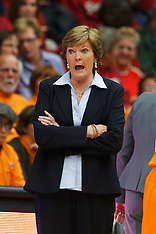 December 19, 2009; Stanford, CA, USA; The Stanford Cardinal defeated the Tennessee Lady Volunteers 67-52 in NCAA Women's Basketball at Maples Pavilion. 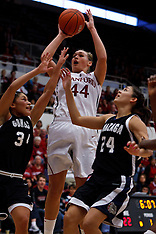 December 15, 2009; Stanford, CA, USA; The Stanford Cardinal defeated the Duke Blue Devils 71-55 in NCAA women's basketball at Maples Pavilion. 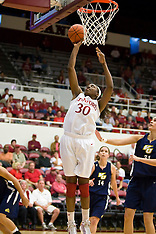 November 1, 2009; Stanford, CA USA; The Stanford Cardinal defeated the Vanguard Lions 107-49 in a preseason NCAA Women's Basketball game at Maples Pavilion. 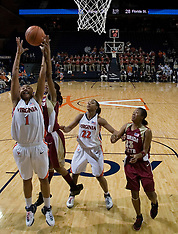 The #21 ranked Virginia Cavaliers defeated the Boston College Eagles 90-70 in NCAA Women's Basketball at the John Paul Jones Arena on the Grounds of the University of Virginia in Charlottesville, VA on February 22, 2009. 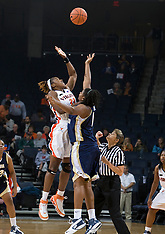 The #21 ranked Virginia Cavliers defeated the Miami Hurricanes in NCAA Women's Basketball 85-74 in overtime at the John Paul Jones Arena in Charlottesville, VA on February 19, 2009. 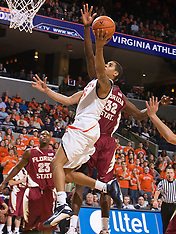 The Florida State Seminoles defeated the Virginia Cavaliers 73-62 at the John Paul Jones Arena on the Grounds of the University of Virginia in Charlottesville, VA on January 24, 2009. 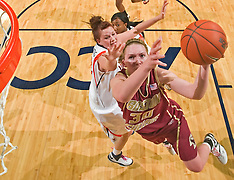 The #22 ranked Florida State Seminoles defeated the #16 ranked Virginia Cavaliers 80-75 at the John Paul Jones Arena on the Grounds of the University of Virginia in Charlottesville, VA on January 23, 2009. 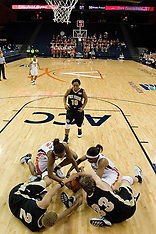 The #15 ranked Virginia Cavaliers defeated the Wake Forest Demon Deacons 77-59 in NCAA Women's Basketball at the John Paul Jones Arena on the Grounds of the University of Virginia in Charlottesville, VA on January 11, 2009. 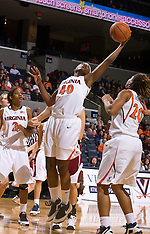 The #15 ranked Virginia Cavaliers defeated the St. Francis (Pa.) Red Storm 82-66 in NCAA Women's Basketball at the John Paul Jones Arena in Charlottesville, VA on January 5, 2009. 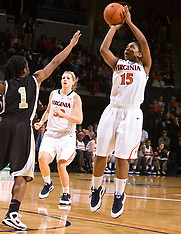 The #15 ranked Virginia Cavaliers defeated the Georgia Lady Bulldogs 62-60 in NCAA Women's Basketball at the John Paul Jones Arena on the Grounds of the University of Virginia in Charlottesville, VA on January 2, 2009. 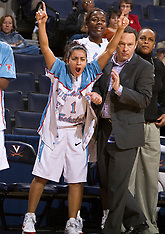 The Louisiana Tech Lady Techsters defeated the UMBC Retrievers 83-62 in the Marriott Cavalier Classic NCAA Women's Basketball tournament at the John Paul Jones Arena on the Grounds of the University of Virginia in Charlottesville, VA on December 28, 2008. 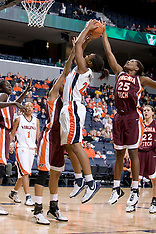 The #15 ranked Virginia Cavaliers defeated the Rider Broncs 83-38 in the first round of the Marriott Cavalier Classic Women's NCAA Basketball tournament at the John Paul Jones Arena in Charlottesville, VA on December 28, 2008. 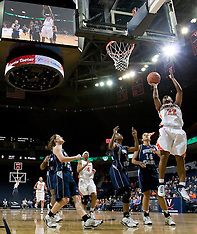 The #17 ranked Virginia Cavaliers defeated the Monmouth Hawks 71-45 in NCAA women's basketball at the John Paul Jones Arena on the Grounds of the University of Virginia in Charlottesville, VA on December 18, 2008. 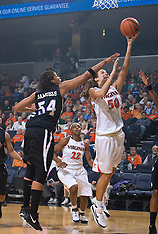 The #16 ranked Virginia Cavaliers defeated the Colorado Buffaloes 77-43 in NCAA Women's Basketball at the John Paul Jones Arena on the Grounds of the University of Virginia in Charlottesville, VA on November 24, 2008. 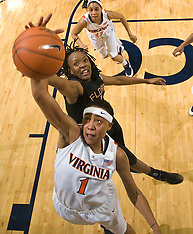 The #15 ranked Virginia Cavaliers defeated the High Point Panthers 78-48 in NCAA Women's Basketball at the John Paul Jones Arena on the Grounds of the University of Virginia in Charlottesville, VA on November 14, 2008. 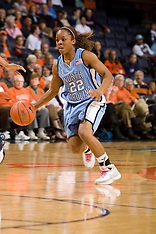 The North Carolina Tar Heels defeated the Georgia Bulldogs 80-66 in the second round of the 2008 NCAA Women's Division I Basketball Championship at the Ted Constant Center in Norfolk, VA on March 25, 2008. 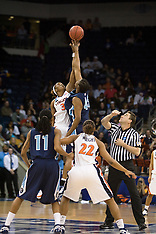 The #11 ranked / #5 seed Old Dominion Lady Monarchs defeated the #24 ranked / #4 seed Virginia Cavaliers 88-85 in overtime in second round of the 2008 NCAA Women's Basketball Tournament at the Ted Constant Convocation Center in Norfolk, VA on March 25, 2008. 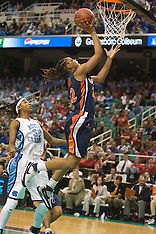 The #2 North Carolina Tar Heels defeated the #25 Virginia Cavaliers 80-65 in the semifinals of the 2008 ACC Women's Basketball Tournament at the Greensboro Coliseum in Greensboro, NC on March 8, 2008. 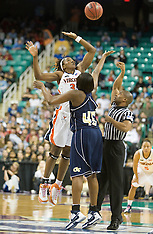 The #25 ranked Virginia Cavaliers (#4 seed) defeated the Georgia Tech Yellow Jackets (#5 seed) 52-43 in the quarterfinals of the 2008 Women's ACC Basketball Tournament at the Greensboro Coliseum in Greensboro, North Carolina on March 7, 2008. 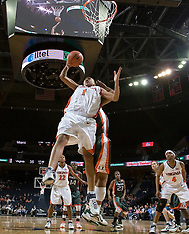 The Virginia Cavaliers defeated the Clemson Tigers 83-71 at the John Paul Jones Arena in Charlottesville, VA on February 21, 2008. The #3 North Carolina Tar Heels defeated the Virginia Cavaliers 90-82 at the John Paul Jones Arena in Charlottesville, VA on February 15, 2008. 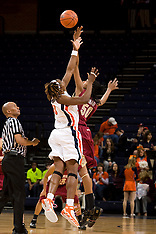 The Virginia Cavaliers defeated the Florida State Seminoles 77-58 at the John Paul Jones Arena in Charlottesville, VA on February 10, 2008. 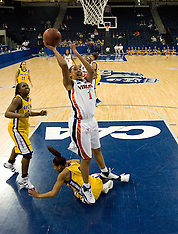 The Virginia Cavaliers defeated the Morehead State Eagles 88-43 at the John Paul Jones Arena in Charlottesville, VA on February 4, 2008. 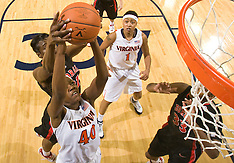 The Virginia Cavaliers defeated the NC State Wolfpack 74-49 at the John Paul Jones Arena in Charlottesville, VA on February 1, 2008. 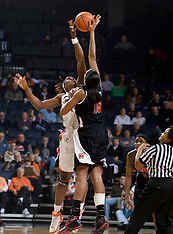 The #4 ranked Maryland Terrapins defeated the Virginia Cavaliers in women's basketball 74-62 at the John Paul Jones Arena in Charlottesville, VA on January 18, 2008. 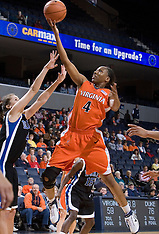 The Virginia Cavaliers defeated the Rhode Island Rams 89-53 in women's NCAA basketball at the John Paul Jones Arena in Charlottesville, VA on January 9, 2008. 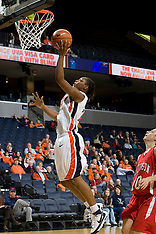 The Virginia Cavaliers women's basketball team defeated the Davidson Wildcats 83-68 at John Paul Jones Arena in Charlottesville, VA on December 20, 2007. 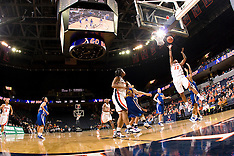 The Virginia Cavaliers faced the Richmond Spiders at John Paul Jones Arena in Charlottesville, VA on November 18, 2007. The #14 ranked George Washington Colonials defeated the Virginia Cavaliers 70-68 at the John Paul Jones Arena in Charlottesville, VA on November 12, 2007. 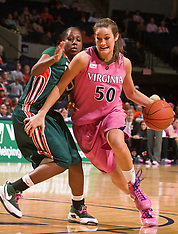 The Virginia Cavaliers women's basketball team faced Team Concept in an exhibition game at the John Paul Jones Arena in Charlottesville, VA on November 5, 2007. 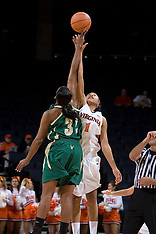 The Virginia Cavaliers defeated the South Florida Bulls 73-71 in the third round of the WNIT held at the John Paul Jones Arena in Charlottesville, VA on March 22, 2007. 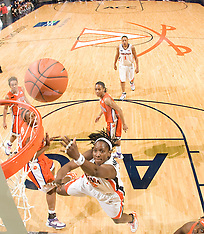 The Virginia Cavaliers women's basketball team defeated the University of North Carolina - Charlotte 74-72 in the second round of the women's NIT at John Paul Jones Arena in Charlottesville, VA on March 19, 2007. 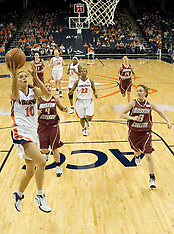 The Virginia Cavaliers fell to the Florida State Seminoles 78-76 at the John Paul Jones Arena in Charlottesville, VA on February 18, 2007. #1 ranked Duke Blue Devils defeated UVA in Charlottesville, 76-61 on Feb. 2, 2007.